This past weekend was a significant reminder as to why I wanted to start blogging about food, family, and fun. Saturday, my older brother turned 40, and Sunday, of course, was Easter. In a strange turn of events, I hosted my family for dinner both nights. For some, it seems daunting, but I looked at this way, the table was already set, so it was just a matter of changing my mind set when I was planning out my weekend shopping and cooking. Here is a little organizational pro-tip. WRITE IT DOWN! It sounds silly, but it keeps you organized and on task. Writing a plan also allows you to see where you may have weaknesses and strengths, where you can buy time, and where you can’t. And just like that you can be hosting two dinners two nights in a row. 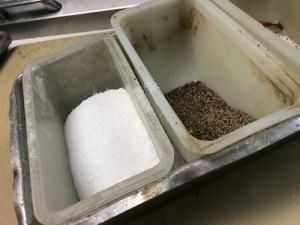 Here is a little of mine vs Chef’s. Keeping in mind, mine covered three days, his is just from one. Does your family have holiday classics? Maybe you always have ham or lamb on Easter, and prime rib on Christmas, and your Uncle Joe roasts a whole pig for July 4th. Yes, that’s my family. And our Easter menu hasn’t changed too much over the years. As you can likely see from above, I assembled this Saturday, to serve Sunday. I started out by boiling 5 pounds of red potatoes, evenly chopped. Once boiled, drain and set to the side to allow to cool. While the potatoes were coming up to a boil, I oven baked 1 pound of applewood smoked bacon. And hard boiled 5 eggs. As the potatoes were cooling, I chopped one bunch of celery, and the bacon. I put the celery and bacon in the largest bowl I own. 6 quarts to be exact. In a separate bowl, I combined sour cream, mayonnaise, and salt and pepper for the sauce. Once the potatoes were cool to the touch, I put them in the bowl with the celery and bacon, plus shredded cheddar cheese, the five eggs, rough chopped, and lastly the sauce. Then I stood there thinking several things. This bowl is never as big as I imagine. I really wish I had grabbed some plastic kitchen gloves from the restaurant because mixing by hand would be so much easier. That I should have made extra for my Uncle Greg. And lastly, I knew my sister in law Casey would be so happy for some of these leftovers. I grabbed my biggest mixing spoon and went to town. Throwing some scallions on top for good measure. First bite. Mmmm. Mmmm. Good. Here is something unique about taking food pictures. I take them up close because I want you to see the food, but I also don’t want you to see the Legos, the paper towels, the homework sheets, Darth Vadar gum dispenser, and litany of other things hanging out in my kitchen, however, as I was gathering all my ingredients, I realized you need space for this recipe. It doesn’t take long to assemble, but you need space, and so I snapped this pre0-assembly, and now you can see what lives on my kitchen counters, and one day, years from now, when I remodel, I will still take food pictures up close, so you don’t see the litany on those counters, either. Serves many (20), and can easily be halved for 10. In a large bowl, combine in the following order to make mixing easier, celery, bacon, potatoes, cheese, and eggs. 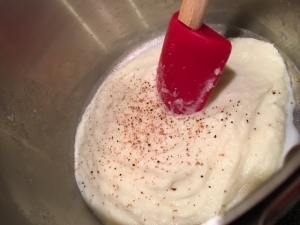 In a separate bowl, combine, the sour cream, mayo, and salt and pepper. Pour into the potatoes. Mix well. Taste test to see that seasoning is good, add s&p if needed. Top with scallions. Cover and refrigerate until you are ready to serve. Ever since I was a child, I have loved this long standing tradition of dyeing Easter eggs. And when I think back, there were five littles, and I feel like we dyed eggs for days. Mom? How many eggs did you hard cook? Times have changed, and with only two littles here, and neither one will even eat eggs, it’s just a dozen. They each get five, I grab two for me because I am not missing out on the fun. Before we get to the fun, let’s talk about the best way, and easiest way (at least for me) to hard cook eggs that PEEL easily. Before you even put the eggs in the pot, you are going to need a sharp object to poke small holes in the tops of the eggs. I used a kabob skewer. Gently poke a hole in the top. Ok, as gently as you can. You are going to have use some force. Just take your time. Leaving them in the carton helps give you much need leverage and keeps you from cracking an egg in your hand. Oh, it’s happened friends, and it wasn’t pretty. This step is important; it allows for easy peeling of the eggs when the time comes. Once you have holes poked in all your eggs, place them in large pot. Cover with cold water. Cook on high heat, until you have brought the water to a rolling boil. Remove from heat, and cover with a lid. Set the timer to 15 minutes. I actually took a picture of the pot covered, but my phone was flipped and therefore you would be looking at an upside down pot with my hand, and phone reflected in it. So for this step, just imagine what your pot looks like with a lid on it. When the 15 minutes are up, pour the hot water out, and run the eggs under cold water for several minutes. When the pot is cool to the touch, the eggs are cool enough. After cooling, you can peel and eat, peel and make an egg sandwich, peel and put in a salad, peel and make deviled eggs. Or in my case, I put them in the carton and returned them to the fridge until I was ready for dyeing. Some of you Pinterest users will remember a few years back the Kool-Aid® egg dyeing hack. I am not going to lie, the first year dyeing eggs with L&L, I did it. And it worked. And it wasn’t super messy. And all the while my mom was complaining that egg dyeing wasn’t the same without the vinegar scent in the air. And afterwards, I had to agree. So, I returned to the ever classic McCormick® method. So here’s a funny little thing. We get our eggs delivered from South Mountain Creamery, and they are brown. Each year, I say to myself that I will right down the colors that don’t really work, and each year, I forget. Now I don’t have to because I am just going to document it here. For the record, when dyeing brown eggs purple, orange, lime green are not your best color options. I didn’t realize until I was already setting up that I only had the NEON color pack, so next year I may have more to add. We practiced dyeing eggs two colors with out even using the special PAAS® egg holder. Since we are on the 1980s for a minute another lesson I learned today. Apparently a 16 box of crayons doesn’t have the color white in it. And washable crayons don’t work on dyeing eggs. And thus, I wrote our names in permanent marker. Next year, I am going to have to fix that. I remember it being like magic. I want that for L&L too. Lastly, my mom would keep the eggs in a basket and just put them back in the fridge. Clearly, the tradition continues. Last night, I attended L2’s school’s Annual Purse Bingo. It’s such a hoot! And even though I didn’t take away the beautiful baby blue Kate Spade purse I was coveting, as was my neighbor, I had a great time just catching up with both life-long friends and new friends, too. The event is pretty relaxed in that we can all bring our own food. The first year my friend Amy and I attended, our friend Angie (not me, another) gave us the snack 411. Thank goodness she did. Snacks and treats for all to share. It just makes the event that much more fun. My problem. I really had no idea what I wanted to share. Couldn’t be something hot because there was no way to keep it warm. And I really didn’t want to invest a ton of time making it because I knew I would be at LT’s school most the day. That pretty much was narrowing me down to the category of cheese plate or dip. And I didn’t have cheese. Or anything else one needs to assemble a cheese plate. So dip it was. Boy was I glad that worked out because you peeps are gonna love this recipe. Before I left to volunteer at LT’s school, I pulled a block of cream cheese out to bring it to room temperature. Once I got home assembling the dip was easy as 1-2-3. I started out with cream cheese, sour cream, and S&P in my KitchenAid mixer. I mixed until it was just combined. I added the shallots, parsley, capers, lime juice, and more salt and pepper to my cream cheese mixture, and quickly folded all in with a rubber spatula. Here is the smoked salmon before I gave it a rough chop. And after, but before mixing it all together. Using my rubber spatula, I folded the smoked salmon into the rest of the ingredients. I did a taste test and added a bit more salt and pepper. One of my favorite ways to eat this dip is on sliced cucumber. I am not going to lie, for the sake of convenience, last night I served it with Everything pretzels chips. This morning, I spread the little bit left on an Everything bagel. I think you see two things. This is a versatile dip and can be served as a snack, or at breakfast along side some scrambled eggs, or in scrambled eggs. The second thing, I clearly like the flavors on Everything everythings. Combine the cream cheese and sour cream. Fold in capers, shallots, parsley, lime or lemon juice, and salt and pepper. Fold in the smoked salmon. Refrigerate until ready to serve. With St. Patrick’s Day just around the corner, I mean tomorrow, I couldn’t let this chance go by and not share one of my ultimate guilty pleasure cocktails – The Grasshopper. I will admit, I completely romanticize this cocktail. I dream of long forgotten 1940s cocktail parties, where ladies wore stunning dresses with sweetheart necklines, cap sleeves and necklaces of pearls. I know you are imagining it. The men in their suits, after a game of cards, sipping bourbon and smoking cigars. While the ladies finish the evening gossip sipping on Grasshoppers. Well, lets get to it. Maybe you too want a delicious green cocktail. Ground Rule! I know we have racked up a few. When making any cocktail served up*, chilling the glass first is rule number one. *A cocktail that is shaken or stirred over ice, but not served on ice. My master in cocktail training, my father-in-law, Fernand aka FT, taught me this. And trust me, it’s worth the extra step. You will need a cocktail shaker with ice. Follow that up with an equal part of heavy cream. I know what you are thinking – Mint Chocolate Chip Dream. Yes, yes. You would be correct. Stain the ice. And ENJOY! Combine over ice in a cocktail shaker. Shake. Strain into a chilled martini glass. You don’t have a cocktail shaker, not problem. Combine all the ingredients in a glass and pass back and forth between two glasses until well combined. Because I couldn’t figure out away to hook a coffee iv up, I needed a simple dinner. I hit Costco earlier for a few things, and snagged a rotisserie chicken. It is the ultimate cheat, I freely admit. I didn’t really have much of an idea for dinner past that. Then. Dun Dun Dah Dun! In my fridge was a bag of cauliflower florets. Boil until the cauliflower is fork tender. It only takes a few minutes. Five at the most. Return the pot back to the stove top and on low heat melt your butter with some milk. 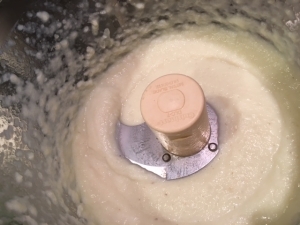 In the food processor, add the cauliflower, and butter and milk. Pulse away. This is great time to get the kids involved. My guys love taking turns pressing the button. The irony – neither will eat this recipe. It’s just all about button pushing to them. Here you are all puréed. Now for the fun. You could very easily add salt and pepper to taste and be done. I like to mix it up. Tonight, I added a pinch of fresh ground nutmeg. If you don’t use fresh nutmeg often – it is very strong in flavor. A little can long away. Always start out with less, taste and add more if you need. Nutmeg will quickly over power any dish if you add too much. Finish with salt and pepper. Tonight, I added some sour cream too. DLS Monday was long, this was an easy dish that was flavorful, and comforting. – Add whole garlic cloves the cauliflower when boiling and purée along with it. – After puréed, add parmesan cheese. – Add a pinch of nutmeg, along with salt and pepper. – After puréed, add sour cream. In a medium pot, bring salted water to a boil on high heat. Boil the cauliflower until fork tender, and no longer than five minutes. Strain. Return the pot to the stove on low heat and melt the butter and milk together. Combine in a food processor. Pulse several times until puréed. Add salt and pepper, and any extras. Serve it up! Let’s face it. 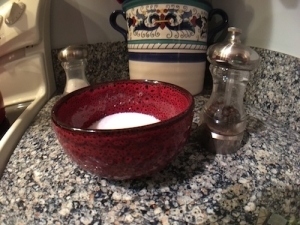 We all have our favorite recipes, drinks, desserts, even kitchen tools, BUT no matter what any of those items may be, we are often neglectful of the most important items in our kitchens. That’s right, I am talking about good ole S&P! Salt and pepper are the back bones of flavoring food. It’s the difference between ‘eh’ food or ‘really-excellent-worth-every-second-you-spent-cooking-and-eating’ food. This is probably the most important lesson Michel has driven home with me over ten years of cooking at home, and nearly forty years teaching in kitchens. Seasoning with salt and pepper through out the cooking process is the key to the best food. Making the most important cooking ingredient easily accessible, makes the whole process easier. And it serves as a constant reminder. Add an ingredient, add salt and pepper. I prefer to use kosher salt and fresh ground black pepper. Michel uses the same at Tersiguel’s. You can use what you like. Iodized, kosher, sea. They are all good. Black, pink, mixed peppercorns. Whatever you prefer. There are many other salts and peppers in the world. Some I have been lucky enough to try on dishes in restaurants, and others I have experimented with in my own kitchen. For now, above all else, I needed to get this ground rule out there. We all can experiment in the future. Just a quick recap – this post has nothing to do with food, and sometimes we just gotta be fluid, so here it goes. This is how today went. My alarm goes off at 6:15. I am a night owl. I have literally spent the last ten years of my life tricking my brain, training my brain and my body to get a good night’s sleep, so I go to bed earlier than I want, and seem to get up in the morning a functioning adult, so I think it’s working. Like everyone, we have a morning routine. Ours involves one parent going off to work (Michel), and one parent (me) taking care of our beast dog, Gale, and two sons, and Monday thru Friday getting them ready and off to school. (One day, in the future, when I am really feeling feisty, you guys can get a glimpse of my love for carpool.) Today started out like every other typical morning. I did notice the sky was a bit brighter a bit earlier, and it’s the ultimate sign that spring is on its way. It was all fun and games until L&L and I were walking out the door, and I noticed our ten year old washing machine was no longer spinning. I got in the van thinking, “Okay. Ten years. We got our money’s worth. When will I have time to research a new machine.” Like every mother, working in the home or in the office, it’s true, our brains are straight up one million, yes one million opened tabs. And so, I got LT off. Phew. L2 and I were headed to see Uncle Luke, who unfortunately was suffering from twelve stitches in the leg and a cut finger from a motorcycle accident the night before. Thankfully, no serious damage done. On our drive, I was thinking how beautiful it was outside. In Maryland, we don’t see days like today in the second week of March. It was as if God was really smiling down on us. And just as I was thinking that, Michel called to let me know his day hadn’t really started the way he planned either. I was a mix of anger, frustration, and frankly, I just wanted to laugh at how the day was unfolding. We had been up barely two hours and I felt like we were going off the rails. And then, Michel called again. Are you sensing a theme? The restaurant is having the last section of roof repaired, but that was screwed up due to an accidental gas pipe being cut. Wow! Really?!?!?!? I called L2’s school to say our day wasn’t going as planned, and he wouldn’t make it. I texted a few my girlfriends and my brother about the crazy that was taking place. I called my mom. While I was on the phone with her, I realized, the sun is shining, my sunroof is open, God miraculously spared Luke from severe injury, the restaurant wasn’t opened yet, and the gas line would be safely fixed before we did. Mom offered for me to bring my laundry over this weekend. Everything wasn’t coming up roses, but it was all looking a lot better than the previous two hours. And the day kept getting better. It’s amazing how weather can completely change our mood! I noticed around lunch that this new site, with this new blog, was propagating, and soon, Michel and I would be sharing Tersiguel’s and our lives in more intimate way. After school, L&L went swimming at an indoor pool, and had a blast. Michel called to say he was leaving work early, which meant we could hunt for a new washing machine together, and eat dinner together. As we were driving home, I kept thinking, I wanted to share this day with you. Nothing. Literally, nothing special happened. And many things could have really rocked the boat. Instead, I just continued to put my faith in God, and it ended up being a great day. 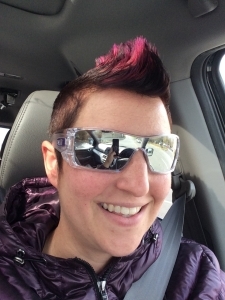 I know this isn’t what I just introduced this blog to be about, but I know we have all been in this boat, some even today. Michel will often say in the kitchen we need to be fluid. We need to be able to change and adapt quickly on the crazy circumstances owning a restaurant can throw our way. Today, I practiced being fluid. I have wanted to start this blog for a long time. Not for fame, or notoriety, but because I really enjoy spending time in the kitchen, cooking, baking, and entertaining. And frankly, I want to share the joy and love with those that are interested. I am one paragraph in, and to be honest, I have to admit two things right of the bat. One, blogging, really well done blogging, is time consuming. The men and women that make careers or even side projects blogging – they are busting booty. I don’t mean to say time consuming as if it’s not worth it. Oh it is. I just need to grow an extra arm to hold my camera while I chop or stir or roll out cookies. And that leads me to the second thing to admit. I am not an exceptional photographer. I am not a photographer. Thank goodness for iPhones and aps that allow me to filter and crop and change direction because without them, this blog would be photo-less. That may not be the end of the world, but it may be nice to have some snap shots to show a how-to, an end product, my favorite appliances, the list is endless. It’s tough to write a blog about cooking, baking, and entertaining without some photos. Is it self-deprecating to throw out two weaknesses before I have even shared my strengths? Well, like the title says, yes, I am the wife of a Chef, and for those that don’t know, my chef husband, also owns a restaurant. It’s a double whammy, and a double adventure. It’s a world that people are often curious about, but even I have a hard time explaining. I don’t eat gourmet meals everyday. I don’t go on Saturday night dates, except for with our sons. Michel and I got married on a Thursday because his weekend isn’t Saturday and Sunday. I don’t celebrate Valentine’s Day, but I love the people that support Michel when they do. I do have a very loving husband that not only works hard to provide for our two sons, Lucas and Landon, and me, but also works hard for our staff and guests. I have watched him in the kitchen for over ten years, learning tricks of the trade, and cooking techniques that I look forward to sharing with you. I do come from a very large family, that is full of tradition, and love and laughter, and I can’t wait to share our traditions and recipes and silly adventures with you. I do love the Baltimore Ravens, even in a losing season, and even more, I love when we gather around together in the family room and share a meal, and cheer them on Sunday afternoons. Or gather in a parking lot and tailgate together. I love my KitchenAid mixer and the looks on L&L’s faces when I drag it to the counters edge. There will be a lot of spoons, and tastes, and cake or cookies, and icing. I love Michel, and our two sons. I love being a stay-at-home-mom and a sometimes – working mom. I love my family, and friends, and the way food brings us together. I love Old Fashions, Irish whiskey, Moscow Mules, Orange Crushes, Cosmopolitans, and Black Box. I love to read, write, go camping, snow tubing, and stand-up paddle boarding. 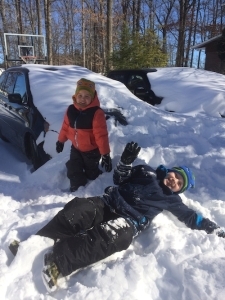 I love SNOW DAYS! I think texting is genius, but spoken word is important too. And I am shameless with hashtags and selfies. Come along with me, let’s go on an adventure.